The Pacific Ocean is large. Since World War II, weapon systems operating in this theater have required special provisions regarding extensive range, long duration performance and relative self-sufficiency during operations. From America’s Gato-class submarines and PBY Catalina flying boats used to fight the Japanese and reassert American hegemony across Asia-Pacific during WWII, to America’s continued presence in Japan, South Korea and islands throughout the region, it is clear the lengths the US has gone through then and now to remain “engaged” in the Pacific. 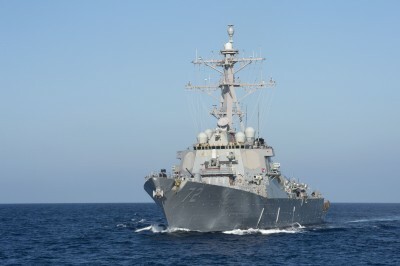 More recently, a report by the Center for Strategic and Budgetary Assessments (CSBA), commissioned by the US Navy titled, “Restoring American Seapower: A New Fleet Architecture for the United States Navy,” obsesses over not how to defend American shores, but how to remain involved in Asia-Pacific despite the immense distances between there, and America. Great power competitors such as China and Russia increased their military capabilities over the last two decades and now appear willing to challenge the international order. However, the report never addresses Chinese or Russian forces landing on American shores, or even threatening to do so. Rather, the report revolves around maintaining hegemony within spheres of influence much more appropriately (and likely inevitably) Chinese or Russian. A more specific point in the 162-page report picked out by The National Interest in an article titled, “How to Guarantee America’s Aircraft Carriers Can Fight China in a War,” involves long-range air sorties of up to 2,000 miles. …a 2000-mile mission would strain human endurance and an unrefueled range of more than 10 hours would require an enormous aircraft that might not fit on a carrier flight deck. Thus, the CSBA proposal calls for a smaller aircraft that would be supported by a tanker. In other words, in order for the US to project considerable force beyond its own borders, across the Pacific Ocean, and within China’s logical, proximal sphere of influence, it needs not only drone aircraft capable of 10 hour sorties, it needs drone tankers to refuel them. Defense contractors surely welcome the report’s findings, since it will require the development of not one new aircraft carrier-based vehicle, but two, including the tanker. To be deterred in the 2030s, aggressors must be presented with the possibility that their goals will be denied or that the immediate costs to pursue them will be prohibitively high. In reality, the “aggression” the United States fears is not the unjust encroachment on other, innocent nations, but rather the undoing of every aspect of its own global order, put together piece by piece through just such aggression. It is an order constructed not within any rational US sphere of influence, rather, one spanning the globe, so far from American shores combat pilots lack the endurance to fly the sorties required to “deter” other nations from reversing America’s grip upon it. Students of history will recognize much of this as a modern-day continuation of European colonization throughout Asia, where sophisticated and overbearing military might was used to corner China and its neighbors across the region, divide and conquer them, as well as prevent them from ever rolling back any of the gains colonial expansion gifted Europe and eventually America in the late 19th century. The CSBA report is just one of many US policy papers that openly and repeatedly admits that China is not a threat to the United States as a nation, but a threat to the hegemonic order that nation attempts to maintain globally well into the 21st century. And while the US seeks drone forces to bridge the vast distances between American territory and the territory it seeks to continue dominating, China and Russia are likewise developing weapon system to make those vast distances greater still. While the CSBA report places urgent imperative in preventing China or Russia from exerting influence within their own territory or along their immediate peripheries, the final conclusion of this new arms race in long-range weapon systems may force the US to accept a reality in which the only region it dominates is the US itself. But the obvious question remains, why isn’t that already the case?